Mr Mustard ( mrmustard@zoho.com ): Enfield Council in time travel trouble. Mr Mustard complained about the use of the non-statutory pre-debt reminder to Enfield Council on 26 January. He had previously complained about it in November and was told that all his points were valid and the reminder would be changed. The revised version was so similar that Mr Mustard didn't notice the subtle differences, he having expected radical change & possibly withdrawal of the use of the reminder as Haringey Council decided at about the time that Mr Mustard complained to them. Nothing has yet changed with the pre-debt reminder? I don't think the contravention description is substantially complaint (sic) as looking at the meter on google streetmap it looks to have the red dash sticker on it. That means that payment could have been made by phone, which is not part of the alleged contravention. Surely this should have been a code 11, parked without payment of the parking charge and your PCN is unsustainable? In the circumstances you could please cancel EF00123456. There then followed a game of email ping pong which culminated in Mr Mustard's complaint being sent from parking to the complaints department from where it will end up with the Ombudsman who, his recent report Fairer Fines shows, is currently concerned about the fair treatment of motorists. As there had been a pre-debt reminder Mr Mustard knew that a charge certificate had been issued. His client had not received the Notice to Owner and was awaiting the Order for Recovery so that the process could be rewound to the Notice to Owner stage. On 27 January Mr Mustard's client sent him a copy of the Order for Recovery. Mr Mustard duly submitted his client's witness statement to the TEC the very same day. On 9 February the council, as they were perfectly entitled to do, issued a fresh Notice to Owner. 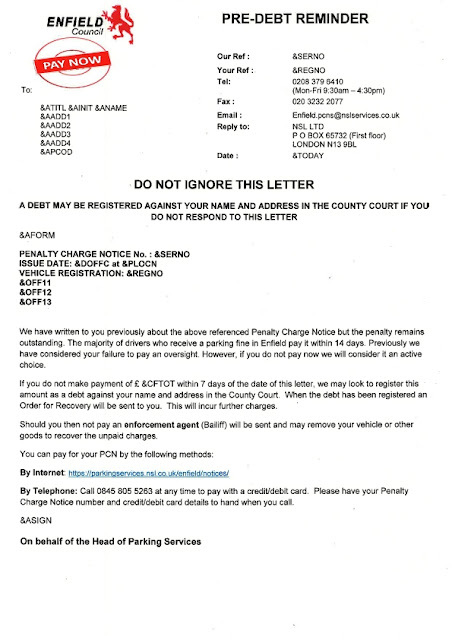 On 15 February Mr Mustard's client sent him a copy of the fresh Notice to Owner and on the same day Mr Mustard went on-line to the Enfield Council computer and made representations that the PCN had been issued for the wrong contravention code. Enfield Council have decided to make Mr Mustard's email of 26 January which pre-dated the Notice to Owner of 9 February into a document which was issued 2 weeks later after the Notice to Owner. In the four years that Mr Mustard has been fighting PCN he has never seen such a blatant procedural impropriety. They are defined as a failure to follow Parking Regulations but you could simply think of them as a council blunder. He know has an Appeal pending which technically he shouldn't have but which he has no doubt will be allowed if it reaches a hearing which it probably won't as Mr Mustard will be filing a further complaint with Enfield Council. Mr Mustard will be making a claim for costs, which is very rare for him, as the council have been wholly unreasonable. Mr Mustard doesn't suppose, or rather hope, that Enfield Council are playing guessing games about the representations that ordinary members of the public intend to make on a future date. If they are though, the public don't know the correct procedure like Mr Mustard does. What the council's actions do disclose though is an indecent haste to reject Representations not yet made by Mr Mustard. The competition for the award of "The most stupid, ruthless, venal, and rapacious council in All England" hots up ! !